A couple of weeks ago, I got an email from someone living nearby who wanted to talk about his investment plan. We arranged a time to meet, and I got to spend an hour being a sounding board. It didn’t take long to discover that he was making a common mistake. It’s one I’ve made, too, and continue to make if I’m not paying attention. When we focus on the market and our investments, we usually do so at the expense of many other important things. We trick ourselves into thinking our investments matter more than anything else, in large part because it’s what we hear the most about. In fact, it’s not unusual to hear people say if they just find the right investment strategy or the next Apple stock or the right “alternative” investment or the right market-timing strategy or the right fund manager, they’d solve all their financial issues. My new friend made a similar argument during our conversation. He followed and read the work of many self-described market strategists, and he tried to translate what they said into his personal investment strategy. That muddle wasn’t leading to a very good outcome. So we stepped back from the question of finding the perfect investment and decided to ask a different question instead, one that everyone should ask themselves. Why not save more? Or, if you’ve already squeezed that rock, then how could you earn a little more in order to save a little more? Ramit Sethi and others have some great insight on this idea. But some questions we usually don’t ask because we’re so focused on the market and our investments. As we talked through these issues, my friend started to see that maybe all his focus on the return he received didn’t matter quite as much as he thought. Maybe there were other things he could do that would save time and frustration. It’s particularly true if you happen to be young and just starting to save. Let’s say you’re a genius, and you’ve spent years developing this fantastic system that could run a hedge fund. One side note: All the evidence says the odds are stacked against you. The more you trade, the worse you do. However, despite all the evidence, your back-testing of your system convinces you. You’re sure your returns will be great for the next 30 years. Now, you’re starting at zero, but you plan to save $100 each month, and the story you tell yourself is it will only take a few hours a week to make your trades, read the research and adjust your strategy. If all goes as planned, at the end of 30 years, you earn 8 percent and end up with $149,035. That’s a nice chunk of change. Now, let’s look at what happens if you asked different questions. Instead of spending all that time and energy to develop a strategy, implement it and then babysit it, you decide to do what the research recommends. You pick a low-cost, diversified option, like a Vanguard target-date fund for someone retiring about 30 years from now. You resign yourself that you’ll get a lower annual return, maybe 6 percent. Then, you devote your time and energy to earning a little extra. You teach a yoga class, start a graphic design business or mow an extra lawn. You find a way to earn an extra $100 a month, so you’re saving $200 each month. By asking a different question, what’s the result? Fast forward 30 years, and you’ll have $200,903. That’s more than 30 percent more money than the other option. Also, you got your life back, and you’ve got a side business that could become something more. Yeah, if you already have a ton of money, then saving an extra $100 each month won’t make a huge difference. 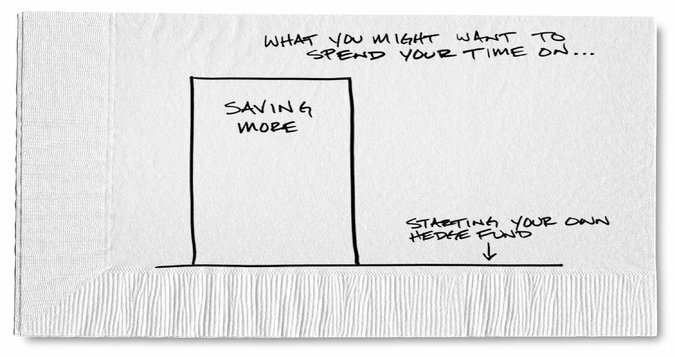 For most of us mere mortals, however, saving a little bit more is going to have a bigger impact than telling ourselves a story that we’re the next great hedge fund manager. So why keep wasting time on returns when there are so many other questions we can ask that will make a difference? Even more important, by asking ourselves different questions, we very well could end up with a better life. That seems like an outcome worth our time and energy. 0 responses on "Featured Blog: Here’s a Money-Making Strategy: Save More"